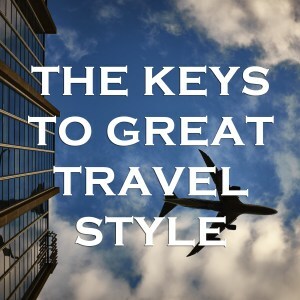 When you hit the road this summer, you have the difficult task of perfecting your travel style. On one hand, you want to look your best so you don’t look back at your vacation photos in horror. On the other, you want to make sure your airport experience is seamless and that you’re comfortable while you’re in the air. To nail great travel style, you need to take an economical approach and find the balance between looking and feeling good. For the duration of your trip, your suitcase is your closet, and that means you don’t have much space. You need to pack versatile shirts that look great poolside and at dinner. The black polo is the answer to all your style problems. Throw it on with a pair of shorts and explore your new destination in style. Or pair it with khakis or trousers for a candlelit dinner by the beach. Black lends the polo a level of elegance that isn’t achieved with other colors. You never want to be the guy who’s intricately unlacing his shoes in the airport security line. It’s crucial to wear shoes you can get in and out of with ease. Our Aspen Bison Slip On offers comfort, dapper style, and ease of use. You can slide them off at a moment’s notice. And your look will evoke classic, masculine style once you arrive at your vacation spot. Wear the Aspen around town while you explore and keep it on for your evening activities. Travel is all about letting go of stress and immersing yourself in a new experience. But it’s hard to do that if you’re bogged down by all your stuff. Keep everything as simple as possible. Downsize your wallet and bring only the essentials like some cash, a credit card, and your identification. Carry them in our Bozeman Bison Leather Wallet, which slides perfectly into your front pocket. Opt for simple black sunglasses that match every look. And choose belts that work seamlessly in both casual and dressy looks. Our Maxwell Braided Leather Belt offers sophistication with a relaxed touch, and feels just as at home with shorts as it does with chinos. So many men focus on comfort over style when traveling. The result? Boarding lines full of guys in oversized sweat suits, ratty t-shirts, and basketball sneakers. Traveling should be comfortable but that doesn’t mean you should dress like a slob. Try slim cut cotton chinos, which offer business casual style and toss on a classic Oxford dress shirt. In a no-iron finish. It’s a durable woven that stands up against wrinkles and looks good without any extra styling. When you hit the road, leave the gym bag at home. Once you’ve put together a savvy, fashion-conscious airport look, you need the travel bag to match. A leather duffel bag, such as the T.B. PHELPS Babson Duffel Bag, is one of the best options. It looks extremely refined, and gives you ample space for all those last-minute things you need to bring along. Travel fashion should be as easy and relaxing as your vacation. You shouldn’t have to sacrifice your style to look good on the go.